Thanks to ERR reader Cathy, I found out about Rachael's participation in the American Library Association's READ program by starring in a poster. 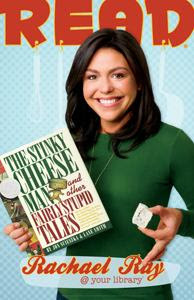 The poster features Rachael and a book titled The Stinky Cheese Man and Other Fairly Stupid Tales. It can be purchased for a mere $16.00. I so remember seeing posters like this in my elementary school library, so it's fun to see Rachael on one! That poster is adorable! I'm making one of my favorite Rachael dishes tonight: Turkey Sweet-Potato Shepherd's Pie. Hope you and the new baby are doing well! Oh you know this is going up in my Library!